A screen shot of the website in question. A federally registered lobbying organization with ties to some of the biggest businesses and organizations in Banff National Park recently launched a slick new website in support of the proposed Icefields Trail project. The website claims to be backed by a group called the “Icefields Trail North Support Coalition,” however the Banff Lake Louise Hospitality Association (BLLHA) confirmed it is behind the website. The BLLHA is a federally registered lobbying organization with 76 regular members and 31 associate members including hotels, restaurants and commercial operators in Banff National Park. In a background document provided to the media, but not available online, BLLHA states the coalition includes seven members including Tourism Jasper, the Tourism Industry Association of Canada, the Association for Mountain Parks Protection and Enjoyment, Banff and Lake Louise Tourism, the Tour of Alberta and the Canada West Ski Areas Association as well as BLLHA. None of this information is available on the website. According to BLLHA, the coalition is a collaborative communication effort of tourism partners/associations, user groups and recreational enthusiasts aimed at ensuring Canadians are aware of and have an opportunity to lend their voice to the proposed project. “Given that some individuals and organizations have come out to publicly oppose the Icefields Trail project, the coalition believes it is important that there is a voice for those who support the project,” the background document states. Canadian Parks and Wilderness Society (CPAWS) , which is also a federally registered lobbying organization, said people should be aware that the website is coming from a group that has an agenda. “I would like to see more information about who is creating this website,” said Alison Ronson, executive director of the northern Alberta chapter of CPAWS. She acknowledged CPAWS has its own agenda, which is to protect Canada’s national parks for both current and future generations, but said her organization is open and transparent about their activities. “We make sure all of our public information links back to CPAW’s website and our mission, vision and mandate,” said Ronson. The website in question includes links to contact the Minister of the Environment and Climate Change Catherine McKenna and the CEO of Parks Canada Daniel Watson. There is also a link to complete Parks Canada’s public consultation survey, which ended on April 24. 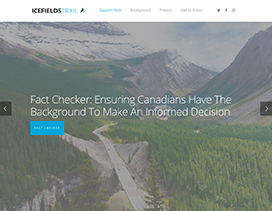 Scrolling through the website users can also find background information about the project as well as a “fact-checker” countering CPAWS’ statements about the trail. “All of the information is true, but I don’t necessarily think it’s informing the Canadian public 100 per cent about the impacts of this trail,” Ronson said about the website. She also said it fails to mention that the trail would go through an important wildlife corridor. The website states 99.99 per cent of Jasper National Park will not be affected by the proposed trail and that it will run parallel to the Icefields Parkway making use of existing disturbed areas to mitigate environmental impacts. On April 4, Darren Reeder, the executive director of BLLHA and a registered lobbyist, sent a letter in support of the Icefields Trail to the minister. The five-page letter explains why the minister should approve the trail and includes legislative context. “In principle this project is consistent with our national park’s objectives for environmental protection while promoting the health and well-being of residents and tourists within both Banff and Jasper,” the letter states. Marie-Pascale Des Rosiers, the press secretary for the minister, said the proposed Icefields Trail is currently in the conceptual phase and no decisions have been made. Lobbying public office holders is a legitimate activity which is regulated by the Lobbying Act. The origin of the Icefields Trail project has remained shrouded in mystery since it was quietly announced in the federal budget in March 2016, but a secret memo obtained by the Fitzhugh reveals Parks Canada started talking about the idea in December 2014. According to a memo to the minister of the environment and climate change, in December 2014 executives with the mountain parks discussed the concept of constructing a 230-kilometre trail that would link Jasper to Lake Louise. The memo was stamped June 30, 2016. The memo stated the estimated cost to complete the project at that time was $160 million over five years according to an assessment conducted by an independent engineering consulting company. The cost estimate was further informed by work undertaken to build the Legacy Trail in Banff National Park. The trail was initially shelved because there was no funding available at the time, however in February 2016, Parks Canada revisited the project after a request from the Department of Finance for infrastructure proposals that could be completed within two years. “Given the two-year constraint Parks Canada submitted a proposal with a reduced scope of work from that which was envisioned in the 2014 proposal,” the memo states. The 2016 budget allocated $65.9 million for the 109-km trail from Jasper to the Columbia Icefields Discovery Centre over two years with Parks Canada chipping in another $20.5 million to complete the project during the third and final year for a total of $86.4 million. According to the memo, the $65.9 million included money for an environmental assessment and design work for the 123-km segment from the Discovery Centre to Lake Louise, but due to time constraints and construction costs no money was allocated to build it. A briefing note from April 2016 shows construction of the trail was originally slated to begin in early 2017 with the trail completed by the fall of 2018. By the end of June the schedule was revised with a targeted completion of March 2019, according to a memo signed by Daniel Watson, the chief executive officer of Parks Canada. The documents that reveal this timeline were among more than 500 pages of emails, memorandums to the minister and draft communication strategies, that were obtained under Freedom of Information legislation by researcher Ken Rubin and provided to the Fitzhugh through a third party. Parks Canada failed to provide a comment before press deadline. The new information follows a federal report by the standing committee of the environment and sustainable development, which recently found it was difficult to understand the decision-making process for development projects in Canada’s national parks. “While there will always be people who disagree with some development decisions, the committee itself discovered that it is difficult to understand the decision-making process,” the report stated. Wayne Stetski, the NDP’s Parks Canada critic, said this was the first time he had heard anything about the origins of the project. “That’s news to me,” Stetski said, who participated with the committee. Alison Woodley, national director for Canadian Parks and Wilderness Society (CPAWS), said the documents show a lack of transparency. “Clearly there was a whole lot of planning going on behind closed doors,” said Woodley. According to Parks Canada, the idea of the Icefields Trail project is based on the 2009 Icefields Strategic Concept, which briefly states the need to “develop” and “explore” options to enhance cyclists’ needs. Parks Canada has also said the project is part of the management plans for both Jasper and Banff National Parks. She said the proposed project should have been made public before it was included in the 2016 budget. Anyone who has lived in Jasper long enough knows by now that the number one priority for Parks Canada is to protect the ecological integrity of Canada’s national parks, yet time and time again it seems that this priority plays second fiddle to development. The latest example is the proposed Icefields Trail project. The project envisions building a paved bike trail from Jasper to the Columbia Icefield, cutting through critical habitat for grizzly bears, woodland caribou, the common nighthawk and whitebark pine, all of which are listed to varying degrees under the Species At Risk Act. While these animals might get the most attention because of their perilous situation, let’s not forget about other animals, such as black bears, wolves and sheep, not to mention the thousands of lodgepole pine trees that will be cut down. On top of this, when Parks Canada initially released details about the project it said it would have no net ecological or culture impact. It’s hard to image how cutting down thousands of trees and paving a 107-km swath of forest will not damage the environment. Initially as a newspaper we were inclined to support the trail, but after listening to environmentalists, attending public consultations and reviewing hundreds of internal documents between Parks Canada staff, it’s clear that this bike trail has no place in a national park. Supporters of the bike path will undoubtedly point to another part of charter’s mandate which states Parks also has a duty to “foster public understanding, appreciation and enjoyment” of Canada’s national parks. While this is indeed true, it doesn’t negate the fact the agency’s number one priority is to protect the park’s ecological integrity. Full stop. In March, Environment Minister Catherine McKenna made it clear during a meeting in Banff that she sees ecological integrity as a top priority. In fact, she went as far as saying that protecting ecological integrity will be front and centre in every decision she makes. If she truly means what she says, rejecting the Icefields Trail project should be a no-brainer. Public consultations for the Icefields Trail project will wrap up on April 24. From mid-July to mid-August, the draft version of the direct impact analysis will be available for review and by September a decision will be made. Let’s hope the minister remembers what she said in Banff when she sits down to make her decision. Internal documents and emails about the proposed Icefields Trail project show pressure from Ottawa to build the paved bike trail as quickly as possible, despite concerns from the local field unit that moving too quickly could put the entire project in jeopardy. Less than a month after the federal government promised $65.9 million for the proposed trail in 2016, Jasper National Park Superintendent Alan Fehr expressed concern with his superiors that the schedule to build the proposed trail within two years was not feasible and could put Parks Canada’s credibility at risk. “We have an opportunity to bring people along on this amazing project, but we need the time to have meaningful consultations with the various stakeholders,” Fehr wrote in an email on April 19, 2016. The documents, which includes more than 500 pages of emails, memorandums to the minister and draft communication strategies, were obtained under Freedom of Information legislation by researcher Ken Rubin and provided to the Fitzhugh through a third party. Parks Canada did not respond to an interview request to comment on the documents. According to a briefing note, construction was originally scheduled to begin in early 2017 with the trail completed by the fall of 2018 in order to meet a request by the Department of Finance to finish the infrastructure project within two years. The project is now slated to be completed by March 2019. Even with a revised schedule, Parks Canada staff with the local field unit continued to express their concerns with the aggressive timeline, which initially included launching public consultations in the fall of 2016. At one meeting last October, there was a suggestion that the project could be a model for meaningful Indigenous and public consultations, however the push by the government to deliver the project quickly risked damaging those efforts. Minutes from the same meeting seem to show Parks Canada staff worried about the optics of the project. Public consultations for the project officially got underway in Jasper on March 14. The controversial project envisions building a paved bike trail from Jasper to Wilcox Campground, near the Columbia Icefield. The total budget is $86.4 million. The majority of the 109-kilometre trail will parallel Highway 93 and use existing trails, portions of the old road, and existing bridges where possible. During the meeting several residents questioned whether public consultations ever have any impact given the last time consultations were held, for the Glacier Skywalk, it was approved despite strong opposition. In response Parks reminded the public it is only a proposal at this time and said that if there are “significant adverse affects” that can’t be mitigated by changing the design it would not to move forward on the project. Alison Woodley, national director for Canadian Parks and Wilderness Society (CPAWS), which has seen the documents, said it reinforced that the project should not be going forward. “The documents clearly identify that this is going to run through critical habitat for four species at risk, so that in and of itself should be enough to stop this,” said Woodley. She said she was shocked to see Parks Canada staff discussing ways to get permits to destroy critical habitat. She also pointed out that what’s even more revealing is what was not found in the documents. A 2016 background document suggests Parks Canada officials have some of the same concerns, particularly when it comes to induced development. According to the documents, pullouts and rest stops may need to be built every five to 10 kilometres and the trail would also need to be connected to campgrounds and other infrastructure, which would require more asphalt. The documents also mention the possibility of building trail spurs to Athabasca and Sunwapta Falls, but there is no money set aside in the current plan for either. The cost to maintain the trail once it’s built has also not been considered. In March, Catherine McKenna, minister of environment and climate change, told an audience in Banff that the government was committed to a renewed focus on ecological integrity and conservation. In the documents there was also plenty of concern about mitigating environmental damage and human-wildlife conflict, particularly between grizzlies and cyclists. Some of the suggestions included manually removing berry bushes along the edge of the trail or using herbicide. Other suggestions included, reducing the speed limit, clearing long sightlines and encouraging cyclists to carry bear spray. In January CPAWS called on McKenna to reject the proposed trail and reinvest the $86.4 million to restore science and conservation programs. It sounds like a no-brainer — a bike trail alongside a world-famous scenic highway through two of Canada’s best-loved national parks. But Parks Canada documents show the proposed trail down the Icefields Parkway between Banff and Jasper raises a host of complications, from damage to wildlife habitat to safety concerns and increased development pressure. “It might sound like an innocent trail, but it also comes with other considerations,” said Alison Ronson of the Canadian Parks and Wilderness Society, which has opposed the current proposal. The most recent federal budget contained $66 million to develop a 107-kilometre bike trail from the Jasper townsite to the Columbia Icefields along the parkway. The trail could eventually extend all the way to Banff. Cyclists currently hug a narrow shoulder along the highway. Parks Canada is proposing a separate, paved route buffered from the busy road by 10 to 20 metres of trees. Parks Canada is conducting public consultations on the idea. Environmental groups have expressed concerns about it. Documents obtained under Freedom of Information legislation by researcher Ken Rubin and provided to The Canadian Press suggest Parks Canada officials have some of the same qualms. “Trail use is likely to be high and will induce further development … or at least demands for further development,” reads a 2016 background document. Pullouts and rest stops may need to be built every five to 10 kilometres. The trail would also have to be connected to campgrounds and other infrastructure with more asphalt. Those pressures are not considered in the current plans or environmental assessments, the document says. The trail would lead through critical habitat for bats, olive-sided flycatchers and two threatened species — the mountain caribou and the whitebark pine. Wetlands along the trail are “insufficiently mapped,” the documents say. A salt lick for mountain goats would have to be considered. The trail could also create encounters between cyclists and grizzly bears. Grizzlies are drawn to berries that grow where trees have been cleared, the documents note, adding cyclists are less likely to carry bear spray and travel quietly at much higher speeds than hikers. “Some mitigation measures could have relatively significant costs which should be factored into decision-making,” the documents say. The documents show Parks Canada is wary of public concern. Parks Canada was unable to provide a staff member to discuss the documents. The agency has previously said it is trying to find ways to widen its appeal beyond traditional visitors. “Developing new services and visitor offers, such as the Icefields trail, allows more Canadians, including youth and newcomers, to experience the outdoors and learn about our environment.” spokesman Steve Young said in an email last summer. Parks Canada’s management plans for the parks do include expanding cycling opportunities. But Ronson said that could be done by expanding the shoulder of the current highway. The documents say that would be difficult to engineer, given the terrain. Ronson’s group has already calculated the amount of paving needed for a trail along the entire highway would be the equivalent of 116 football fields. The total budget for the project is about $86 million. Ronson said that money would be better spent on Parks Canada’s primary job of protecting and studying park environments. “Over the last few years, their budget has been cut so much that we don’t see enough interpretation or education now,” she said. As Parks Canada gets public feedback on an $87 million paved bike trail along the Icefields Parkway from Jasper to the Columbia Icefield, the federal agency is also gearing for a plan to extend the trail to Lake Louise. Parks Canada officials say, based on the outcome of public consultation on the Jasper portion of the trail, they may do project planning this year to extend the trail south to Lake Louise along Highway 93 North. “In order to maximize savings and achieve efficiencies that may exist, consultations for the Icefields Trail South would build on consultations for the Icefields Trail North,” said Steve Young, a spokesman for Jasper National Park. A public open house has been set for Friday (March 17) at Banff Park Lodge at 7 p.m. on Parks’ controversial proposal to build a 109-kilometre paved trail from Jasper to Columbia Icefield and Wilcox Campground. The three-metre wide paved trail would follow the east side of the parkway for most of the route, but cross to the west side from Athabasca Falls to Mount Christie picnic area, and Tangle Hill. The proposal would see the trail cross the highway at least five times, at level crossings with signs and markings. The crossings are planned to get people to attractions and accommodations on the opposite side of the road. Most of the trail would go through an outdoor recreation zone that covers about 100 metres either side of the highway, but about seven kilometres would run through declared wilderness along an abandoned road near Beauty Flats to avoid wetlands. Bow Valley Naturalists (BVN) has serious concerns with the proposal, saying while cycling is a carbon-friendly way for visitors to enjoy the park, a new trail built 20 to 30 metres away from the road in grizzly bear habitat is not the way to do it. BVN says widening the shoulder would be better for cyclists than what’s existing, provide for better views, increase bear and rider safety, be significantly cheaper to build, and, from an ecological perspective, reduce the amount of critical valley bottom habitat lost. They say the narrow valley and high elevation snow tends to concentrate bears in the valley bottom during the short summer season, with roadside bear sightings typically in the hundreds per year. Bunyan said there’s also potential for riders to push a surprised bear into traffic on the highway, or worse, roadside bear jams could scare a bear into cyclists on the bike path. BVN also doesn’t buy into the argument that this is a family-friendly pathway. It won’t be like the Legacy Trail between Banff and Canmore, they say, which runs within a fenced highway corridor, safely separated from wildlife, is close to amenities, with cellphone coverage, multiple start and stop points and to emergency services. “That’s not the case at all along the Icefields Parkway,” said Bunyan. Casey Peirce, AMPPE’s executive director, said it would be a safe and accessible way for people and families and other users to enjoy Jasper National Park without the use of a vehicle. The trail would provide new ways to bring people to the parks, she said, noting it will help people fall in love with nature, thereby boosting conservation efforts because people will want to protect the places they love. “It’s a win for the environment in terms of lowering the carbon footprint in the national parks,” Peirce said. Peirce believes a bike path away from the highway will be a much safer experience for cyclists. “I’ve ridden on that road and most cyclists will agree it can be quite dangerous. It’s quite treacherous in terms of the speed some people travel on the road, and the fact the shoulders are non existent,” she said. Extending the new trail all the way to Lake Louise also has AMPPE’s backing. “I would support the extension from Jasper all the way to Lake Louise because then it becomes a route with an end point,” she said. Even though $87 million for the bike path between Jasper and the Columbia Icefield is already dedicated in the federal budget, Parks Canada’s Young said the project is not a done deal. In a recent interview with the Rocky Mountain Outlook the executive director of AMPPE, Casey Peirce, surmised that a bike trail away from the Icefields Parkway would be a safer experience for cyclists. However, we understand safety has not been an issue with the shoulder of the highway but it almost certainly will be on a trail winding through grizzly bear habitat. Ms Peirce believes this bike trail will be a win for the environment in terms of lowering the carbon footprint. Unfortunately this trail and its access roads will necessitate cutting down thousands of carbon-storing trees; transporting materials – something in the order of 179,000 cubic meters of gravel, drain rock and asphalt in excess of 22,000 truck-loads; not to mention annual maintenance on the trail. In addition, the extraction of the huge amount of gravel from the borrow pits can hardly be achieved without the use of fossil fuels. Ms Peirce points to the success of Banff’s Legacy Trail as an example. But is it realistic to compare a ‘family-friendly’ 22-kilometer trail – fenced to exclude wildlife and unaffected by avalanches, rockslides or washouts – with a proposed trail through critical grizzly bear habitat in steep terrain and typically unpredictable mountain weather far from emergency services in case of an accident? The idea that this is a “win for cyclists” needs to be examined against the fact that it will definitely be a loss for two of Jasper’s most sensitive and at-risk species – grizzly bears and woodland caribou. Bears will attempt to continue to feed along their roadside habitat but if the trail is built their only retreat from the highway will be across the bike trail and if frightened off the bike trail they will head across the highway. In terms of one of Parks Canada’s favourite analogies the bears will be losing 82 “football fields” of scarce valley-bottom land and for over 7 kms the trail is proposed to wander off into the late spring/early summer habitat of the threatened Brazeau caribou herd. This proposal ignores the Jasper management plan that lists two of its most important challenges as being: “the status of woodland caribou” and “the regional grizzly bear population”. Under Key Strategies, Parks commits to: “Ensure activities and facilities do not have any additional impact on key wildlife corridors”. How can Parks Canada go against its own management plan and justify spending $86 million dollars to undertake massive construction work that will do irreparable harm to over 100 kilometers of valley-bottom wildlife habitat in a national park and World Heritage Site. All this for a trail that may be used for at most four months of the year by cyclists who already have a perfectly acceptable highway shoulder that merely needs some basic repairs and the addition of one meter in width? Last week’s Fitzhugh was hard to read. It was at once hopeful and heartbreaking. I was encouraged to see Parks Canada cracking the door on openness with the public about the serious issues facing this park. Alpine ecosystems in decline, grizzly bears dying at unsustainable rates, cougars killed in Jasper and Parks Canada giving up on mountain caribou. How heartbreaking it is to see the decline of our home, and it begs the question: in the absence of such magnificent wildlife, what does Jasper protect? What is here to which visitors can connect? A highway, a ski hill, a bike path, a town, a golf course, a pipeline? National Parks were, and continue to be, established to preserve Canada’s natural heritage for current and future generations. We have unfortunately demonstrated time and again, that in the absence of such protection, this heritage is squandered. Because of this, national parks should look, feel, and be managed differently than other places. This is not an easy task, but it is what we have entrusted Parks Canada to do; to make the case for wilderness even when it is inconvenient to do so. As I read the paper last week, I felt that I was watching Canada’s established national myth of wilderness slip through my fingers. I, like all of us, am culpable in being unwilling at times to support the difficult decisions to protect what I now enjoy. By neglect, I am complicit in deciding that a Jasper without grizzly bears, caribou, cougars, and a healthy alpine still reflects Canada’s natural heritage. Future generations are counting on me, on us, to do what it takes today so that tomorrow, their connection is real, not imagined. According to a recent press release from the minister of environment and climate change, the idea of the proposed Icefields bike trail is based on the Icefields Parkway strategic concept and Jasper and Banff National Park management plans but, oddly enough, we find there is no mention of a separate bike trail in any of these documents. The strategic concept says merely that Parks would ‘explore options’ for cyclists and the Jasper management plan echoes the same phrase. The Banff management plan proposes to “provide 2 km of bike trail between Bow Valley Parkway and Icefields Parkway” to enable cyclists to avoid using the Trans Canada Highway but nothing is suggested that is not already in place with the shoulder on the Icefields Parkway that has been used by cyclists for decades. Parks Canada says it has learned ‘a lot of lessons’ from the Legacy Trail that runs between Banff and Canmore. That’s odd because the Legacy Trail is only 22 km long and entirely fenced from natural hazards. It is safe from avalanches, mudslides, rockfalls and fast-flowing water; there are amenities at both ends and cell phone coverage. There have been a number of accidents on the trail, but it is easily accessible by ambulance. How can one compare this ‘family-friendly’ Banff-Canmore trail to an unfenced 107 km bike trail through mountainous terrain with frequent extreme weather conditions and prime grizzly habitat with potentially dangerous wildlife encounters? We now await the environmental assessment on this surprising plan to spend $86 million of taxpayers’ money on what could essentially be a three-month per year one-activity boondoggle. It will be interesting to see how Parks picks its way through the minefield of unmonitored wildlife populations as well as upcoming stipulations of the strategic action plan under the Species at Risk Act to protect the ‘threatened’ caribou herd whose habitat covers more than 20 km of the proposed trail. No doubt the words ‘minimum’ and ‘mitigations’ will figure prominently to help pull the wool firmly over the public’s eyes. All that is realistically needed is a good repair job and some limited widening of the present parkway shoulder so experienced bikers can continue to enjoy it. The money was prematurely allocated in the federal budget for this specific ‘Icefields Trail’ and Parks will fight to keep it, just as those who care about their irreplaceable national parks should fight to stop it. A proposed trail from Jasper to the Columbia Icefields will cost an extra $20.5 million. A controversial project to build a paved bike trail from Jasper to the Columbia Icefields will cost significantly more than first thought. According to Parks Canada, the proposed trail will cost an extra $20.5 million, which it will pay through its infrastructure investment program. The estimated price tag to build the 107-km trail is now $86.4 million. Parks Canada said the total cost is based on the outcome of consultations and a detailed impact analysis. In March, the Liberal government earmarked $65.9 million in the federal budget for the consultation, design, and construction of the trail. “When we first were looking at it we were trying to come up with what we thought would be a rough estimate of a total price,” said Alan Fehr, superintendent for Jasper National Park. “In budget 2016 they put $65.9 million towards this proposal and it was determined that if there was more money required that Parks Canada would take care of that out of the infrastructure investment fund that we have,” he said, explaining the money is coming from Parks’ national capital budget. In June, five environmental groups voiced their opposition to the project citing a lack of public input. The groups also said they feared a paved trail would damage critical habitat for endangered species. In a press release published on Jan. 6, Canadian Parks and Wilderness Society (CPAWS) called on Catherine McKenna, the minister of Environment and Climate Change, to reject the project. Jill Seaton, chair of the Jasper Environmental Association, echoed those concerns, but said her organization would prefer to see Parks Canada widen the shoulders of the highway rather than create a new trail. “It would be nice to have something down there, but they’ve already got it. They’ve got the shoulder of the highway, make it wider, that’s all they need to do.” said Seaton. She said she’s also concerned about where they are going to get the gravel to build the trail. According to Parks Canada, the project is based on the Icefields Parkway Strategic Concept, which was guided by a public steering committee and included Indigenous representation. The agency also said the project is part of the management plans for both Jasper and Banff National Parks. While Jasper’s management plan doesn’t specifically mention a paved trail from Jasper to the Columbia Icefields, the Banff management plan mentions it four times. According to Parks Canada, the multi-use trail will run parallel to the Icefields Parkway and make use of areas that have already been disturbed, such as the old paved highway, and could be extended to Lake Louise. Public consultations will begin in early 2017 with a targeted completion date of March 2019. “We’re in the conceptual phase of this project, it’s a proposal,” said Fehr. He said public consultations will begin within the next few weeks, including a series of public meetings. There will also be an online component and Fehr said Parks intends to publicly share a draft of its detailed impact assessment with the public. “We want people to see what the potential issues are and how they might be mitigated and then based on that information then the minister will make a decision whether we’re going to proceed or not,” said Fehr. Despite his reassurance, Seaton cast doubt about whether public consultations will actually amount to anything. “They always have public consultations, but do they listen to them?” asked Seaton. CPAWS called on the government to use the money to restore science capacity and conservation programs and urged Canadians to voice their concerns about the proposal. The Association for Mountain Parks Protection & Enjoyment (AMPEE), a vocal supporter of the project, said it supported the government’s detailed impact assessment process. “AMPPE believes in the federally mandated impact assessment process that ensures the responsible usage of our mountain parks and the protection of the wildlife within,” wrote Casey Peirce, executive director of the pro-tourism group. Fehr acknowledged that some people are concerned, but pointed out that the area is already zoned for this type of activity. According to Fehr, the outdoor recreation zone extends 100 metres from the centre line on both sides of the highway, however the proposed trail will likely only be about 20 to 30 metres off of the highway. “It’s not going to be on the outer edge of the 100 metres, it’s going to be closer so that as people wind their way through they’ll get a sense that they’re in a natural setting, but they’re safe,” said Fehr. During the telephone interview he played down concerns about paving the trail, explaining that it will reduce maintenance costs and provide a more enjoyable experience for people with strollers and wheelchairs. He said Parks Canada has learned a lot of lessons from the Legacy Trail, which was opened between Banff and Canmore in 2010. Remains of the old Icefields highway. Note the buffalo berry bushes. October 13, 2016. From the Jasper Fitzhugh. Twelve of Canada’s largest environmental groups issued a joint statement calling on the federal government to prohibit any future development in Canada’s national parks–but not everyone agrees. The group—which includes the Canadian Parks and Wilderness Society (CPAWS) and the David Suzuki Foundation—met with Parks Canada last week in Banff to discuss their concerns. The groups are concerned Parks Canada has become too focused on increasing visitation and tourism instead of protecting the ecological integrity of Canada’s national parks. The statement specifically asked the government to “say no” to the conceptual proposal to build overnight accommodations at Maligne Lake and the proposed bike path from Jasper to the Columbia Icefield. The statement also asked the government to “say no” to the Lake Louise Ski Resort expansion. “We are saying ‘no’ to inappropriate development in our national parks, which would go against the mandate of our parks, which is to protect nature and wilderness habitat for the benefit of both current and future Canadians,” said Alison Ronson, executive director of the northern Alberta chapter of CPAWS. She pointed to traffic jams and the number of animals that have been killed this year as examples. In August, Parks Canada confirmed it had killed at least five elk and a black bear in Jasper National Park this year. In Banff, six wolves have died of unnatural causes in the Bow Valley, according to the Rocky Mountain Outlook. “It’s not the visitors’ fault. The parks are for people and we want people to connect with nature, but it needs to be managed properly so we don’t have these negative impacts on the parks, such as wildlife having to be killed,” said Ronson. The Association for Mountain Parks Protection & Enjoyment (AMPPE) said it supports the responsible use of Canada’s national parks, but said there needs to be a balance between protection and development. “Banff and Jasper National Parks are internationally renowned destinations that need to be protected–absolutely–but that also has to be in concert with providing a positive visitor experience through sustainable tourism,” said Casey Peirce, executive director of the pro-tourism organization. She reaffirmed her organization’s support of the 107-km bike path from Jasper to the Columbia Icefield, and chided the environmental groups for misleading the public about the proposal to build overnight accommodations at Maligne Lake and the expansion at Lake Louise. “Often the claims coming from these groups are emotional and they are not based on scientific evidence,” said Peirce. Ronson shot back, describing Peirce’s comment as an “unfair assessment” of the groups’ statement. Parks Canada also weighed in on the debate. “It should be noted that strict development limits are in place to protect the ecological integrity of national parks,” wrote Meaghan Bradley, a communications officer with Parks Canada’s national office. According to Bradley, Parks Canada uses more than 600 independent scientific measurements to help inform its decisions about park-specific priorities and guide conservation investments. She also noted that 97 per cent of Jasper National Park and 96 per cent of Banff National Park has been declared wilderness areas with strong limits on development and use. In November 2015, a federal court judge dismissed a legal challenge disputing Parks Canada’s approval of a conceptual proposal for overnight accommodation at Maligne Lake. The judicial review was filed by Ecojustice on behalf of CPAWS and the Jasper Environmental Association–two conservation groups concerned that overnight accommodation at the lake would negatively affect threatened wildlife in the Maligne Valley. Although the case was dismissed, the judge made it clear that in order for the tent cabins to receive full approval, there would have to be an amendment to the management plan, and such amendment could only be made by the minister of environment and climate change. Brewster, which bought Maligne Tours in January 2016, did not respond to an interview request to confirm whether or not the company was still pursuing the project, however, according to Parks Canada, there are no proposals for development at Maligne Lake. “For the Maligne Valley in Jasper National Park, there are currently no proposals before Parks Canada for development at Maligne Lake,” said Bradley. In June, Parks Canada revealed plans to build a 107-km paved bike trail from Jasper to the Columbia Icefield. The $66-million multi-use trail will run parallel to the Icefields Parkway and make use of areas that have already been disturbed, such as the old paved highway. The hope is that by building a separate trail it will improve cyclists’ safety. Environmental groups fear the trail will damage caribou and grizzly habitat and point to it as the latest example of parks ignoring its mandate to protect the park. AMPPE has been a strong supporter of the project since Parks Canada released details about it and urged those opposed to the project to wait for an environmental assessment to be completed before assessing its ecological impact. In August, the federal government approved new site guidelines allowing Lake Louise Ski Resort to expand its operations. The controversial decision would actually reduce the size of the resort’s leasehold by 669 hectares, but allow the resort to expand in other areas ultimately allowing it to double its current capacity from 6,000 to 11,500 visitors per day. The plan includes more ski lifts, more ski hills, a new lodge and increasing the size of its parking lot. Environmental groups and 11 former Parks managers are opposed to the plan, arguing that doubling the ski resort’s capacity is not an environmental gain.